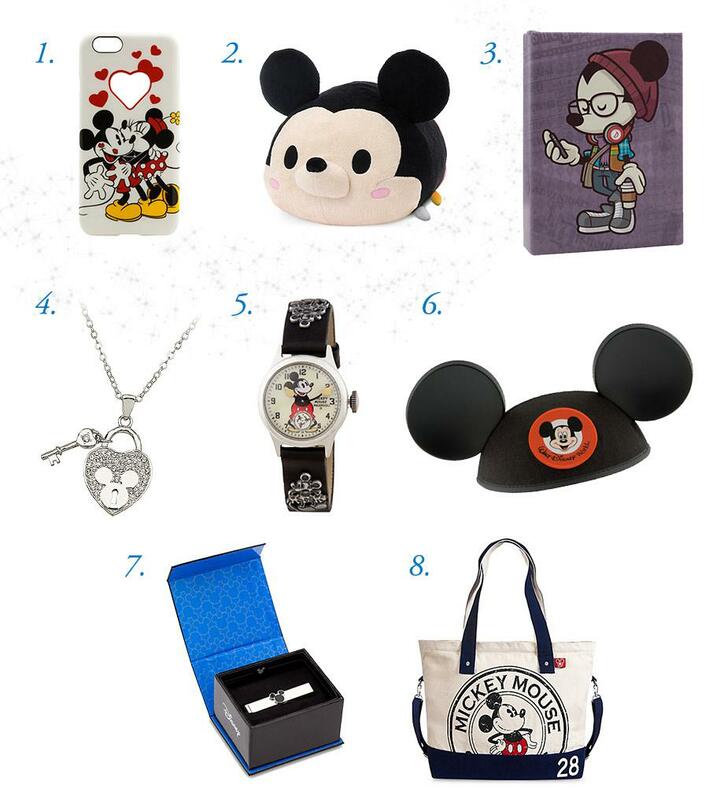 Valentine’s Day is the perfect time to remember someone you love, and if they have a place in their heart for Disney, we know just the place for their gifts. We’ve created this gift guide featuring heart-warming ideas for kids and adults that are sure to speak to that special someone who makes your life part-adventure, part-fairy tale. All princesses, both kids and adults, could use some royal treatment this Valentine’s Day! 1. 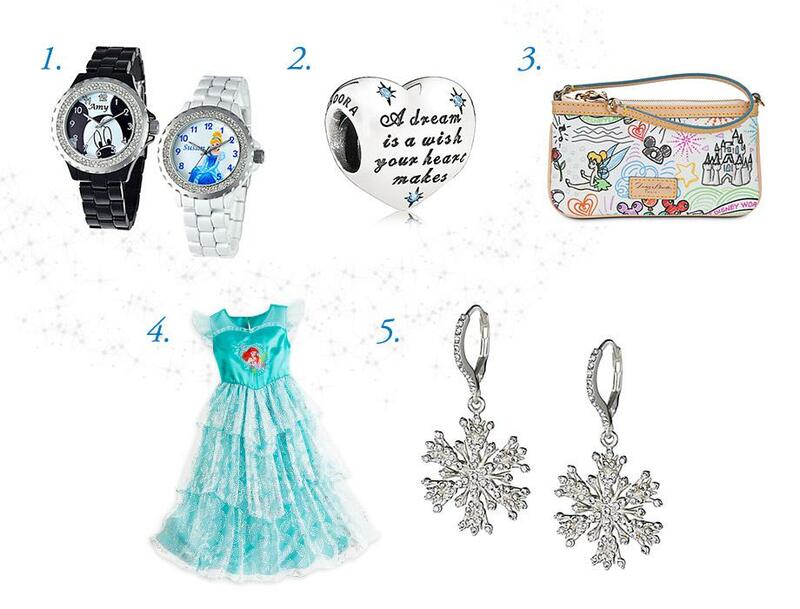 Customizable Rhinestone Watch for Women: It’s always time for your princess to share her love of Disney, and by personalizing this ornate watch’s face, you’ll put a smile on hers! 2. Cinderella Heart Charm: A perfect addition to any Pandora bracelet, this Cinderella charm will remind your sweetheart to never stop dreaming. 3. Disney Sketch Wristlet: This stylish wristlet by Dooney and Bourke is great for all young-at-heart princesses who are always on-the-go. 4. Ariel Nightgown for Girls: Very appropriate attire for all little princesses who want their days to have fairy-tale endings. 5. Elsa Snowflake Earrings: These elegant earrings of sterling silver with Swarovski crystals will put the “ice” in “nice” for special occasions, whatever the season. 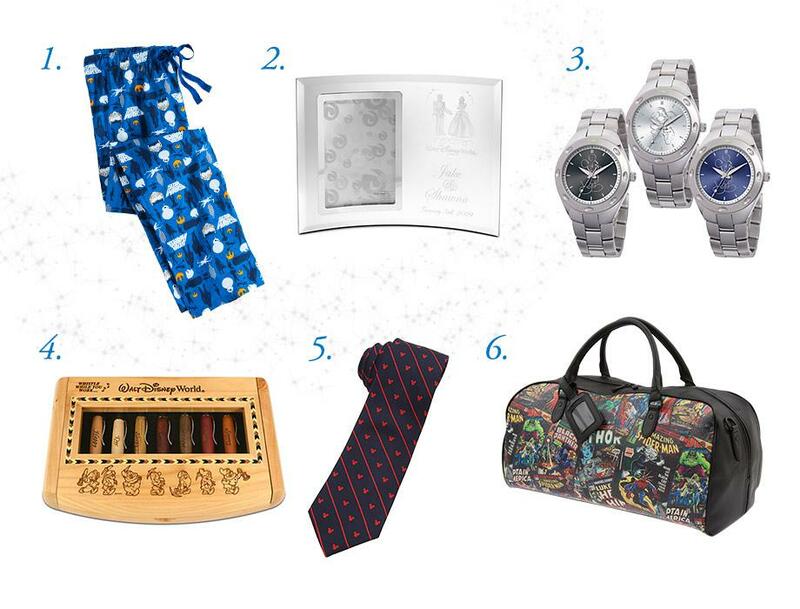 Princes of any age will love one of these noble gift ideas. 1. Star Wars™: The Force Awakens Lounge Pants for Men: Just because the Force is waking up doesn’t mean your prince has to. These all-cotton lounge pants could make even a Sith Lord kick back and relax. 3. Customizable Watch: One of these stainless steel watches will keep a busy prince from being late for very important dates (especially with you). 4. Seven Dwarfs Pen Set: Whether he’s sending out royal letters from his home or office, this pen set will get your prince whistling while he works. 5. Mickey Mouse Silk Tie: When the royal man in your life has business to attend to, send him out into the world with his love for Disney on his sleeve… make that, on his tie! 6. Marvel Comics Duffel Bag: Whether he’s off to the gym to work on his super-strength or flying out of town (either on a plane or with his own powers), this bag is his faithful sidekick! 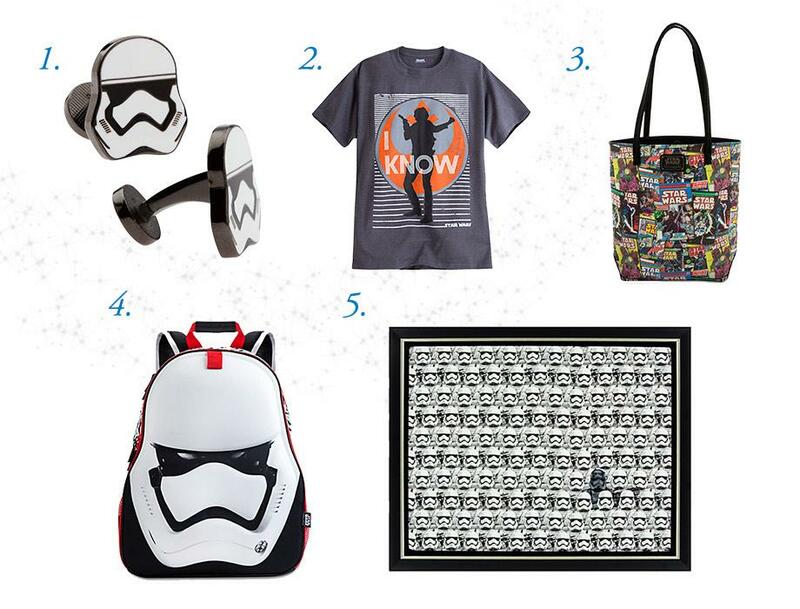 Once you’ve won your Valentine’s heart, there’s a whole galaxy of great gifts to bring to their home planet! 1. Stormtrooper Cufflinks: These polished cufflinks with enamel finish bring an Imperial flourish to a formal occasion. 3. Star Wars Comic Tote: The Force is tote-ally strong with this colorful bag decked out with prints of vintage Star Wars comic covers. 4. Stormtrooper Backpack: Whether heading to school or on a vacation far, far away this backpack holds all the essentials a Stormtrooper needs. 5. Stormtrooper Framed Metal Print: Bring the Star Wars fan in your heart a framed work of pop art so eye-catching, even the Empire would approve. 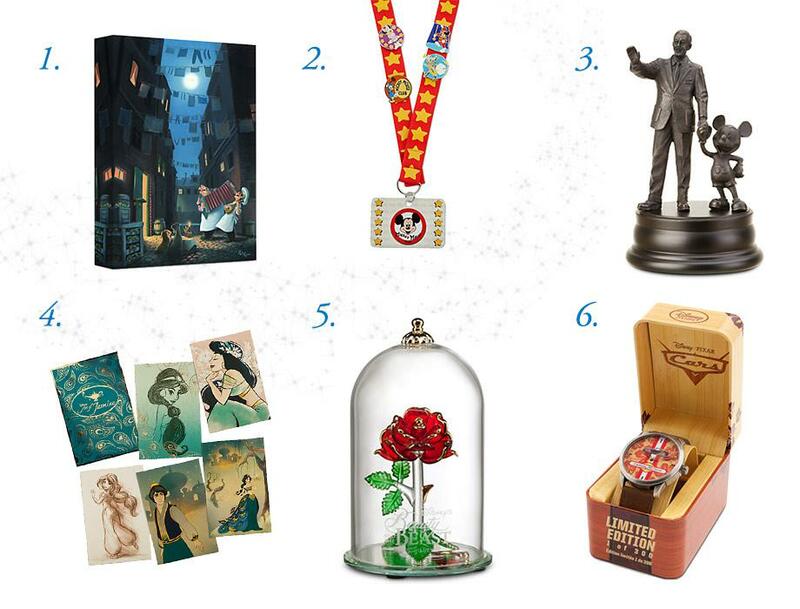 If your Valentine has an eye for the rare, the unusual, the artistic, and the stylish celebrations of all things Disney, these gift ideas will show them you support their passion for all things artistic, stylish, and unique! 1. “Serenade of the Heart” Giclée on Canvas: Make some room on the wall for a gorgeous work of Lady and the Tramp-inspired art celebrating one of the most romantic moments in Disney history! Perfect for art collectors… but bonus points if it comes with a home cooked spaghetti dinner. 2. Pin Starter Kit: For little collectors in the making, a starter kit can launch a lifelong tradition that they’ll always trace back to you. 3. “Partners” Walt & Mickey Statue: For collectors of Disney art or Disney Parks, this bronze replica of the beloved Disney Parks statue will go hand-in-heart… just like you and your Valentine. 4. Art of Jasmine lithograph set: Wish granted! This set brings limited edition prints to an art-collecting prince or princess. 5. Enchanted Rose Glass Sculpture: Cast a love spell like no other on your Valentine with this delicate glass sculpture of the Enchanted Rose from Beauty and the Beast. 6. Lightning McQueen Surfer Watch: The retro style of this limited edition watch will bring the “Aloha” spirit along, no matter how far from the beach the highway takes your valentine. 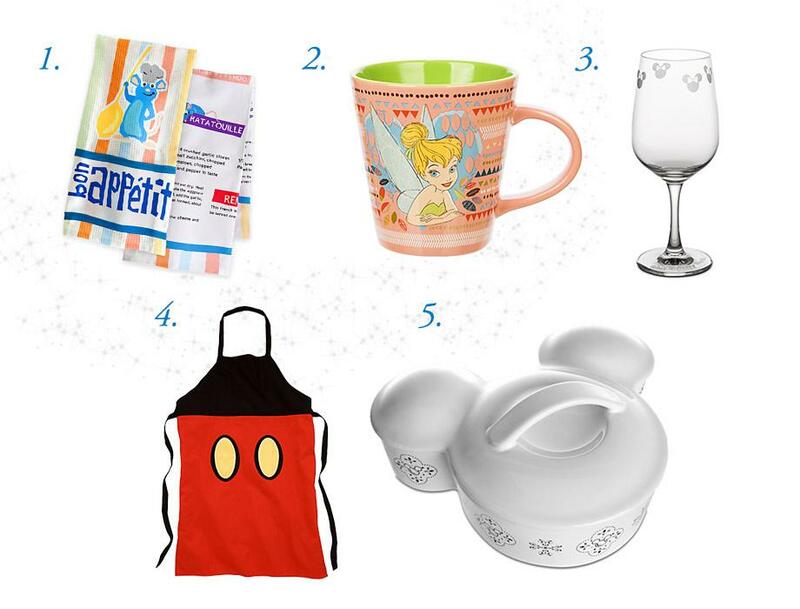 If your Valentine loves cooking as much as they love Disney (and you, of course! ), these gift ideas will spark inspiration for date nights and meals to share together. Bon appétit! 2. Tinker Bell Mug: If your Valentine’s a bit of a coffee snob (or “expert,” as they would say) this mug will inspire them to “think happy thoughts” even if it’s first thing in the morning. 3. Mickey Mouse Icon Wine Glass: Toast the wine-loving sweetheart in your life with a glass any Disney fan will say “cheers” to. 4. Mickey Mouse Apron: “Oh boy!” This apron cooks up a little humor and a lot of love when making a magical meal with your Valentine! 5. Mickey Mouse Casserole Dish: Foodies love a good presentation as much as a good meal, and nothing adds spice to a dinner together like a dish shaped like Mickey! M-I-C-K-E…Why? Because they love you! 2. Mickey Mouse Tsum Tsum: This large-sized Mickey Tsum Tsum makes for a cute companion for Mickey Fans… or a comfy pillow on a Disney movie date night! 5. Adult Mickey Mouse Wrist Watch: The Mickey Mouse watch has certainly stood the test of “time!” Show your Mickey fan they’ll be in your thoughts every second of the day. 6. Mickey Mouse Ears for Kids: It doesn’t get more classic than this for Mickey Fans of all ages. And…it’s a clever way to tell your Valentine there’s a Disney Parks trip on the horizon! 7. Mickey Mouse Icon Tie Clip: This silvertone tie clip with black cloisonné enamel makes the Mickey Mouse Club a formal affair and lends a friendly flourish to any occasion. 8. Mickey Mouse Logo Tote Bag: Bringing smiles to the world since 1928, the mouse who started it all can follow you all around your world, too, be it home, work, or the Happiest Place on Earth!